How to convert Emails to ODT in batch? 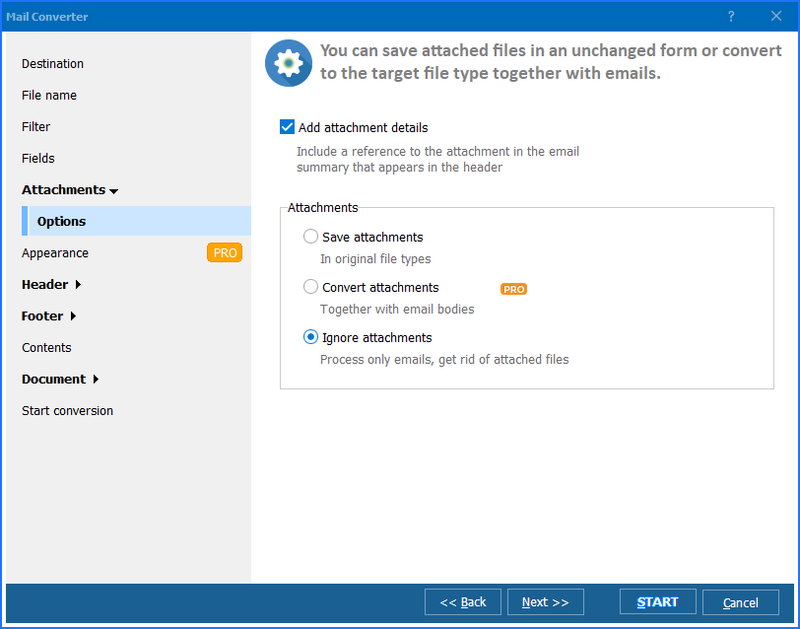 You are here: CoolUtils > Total Mail Converter > How to convert Emails to ODT in batch? Emails are stored in formats that are supported only by email clients. If you have some emails in MSG or EML format stored on your PC, you can read them only after conversion into some text format. If you run OpenOffice, you can convert emails to ODT files that are supported by this text editor. 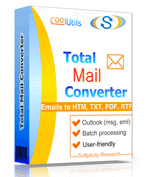 Total Mail Converter provides such function and can process a lot of emails very quickly. Most of converting tools convert messages one by one. 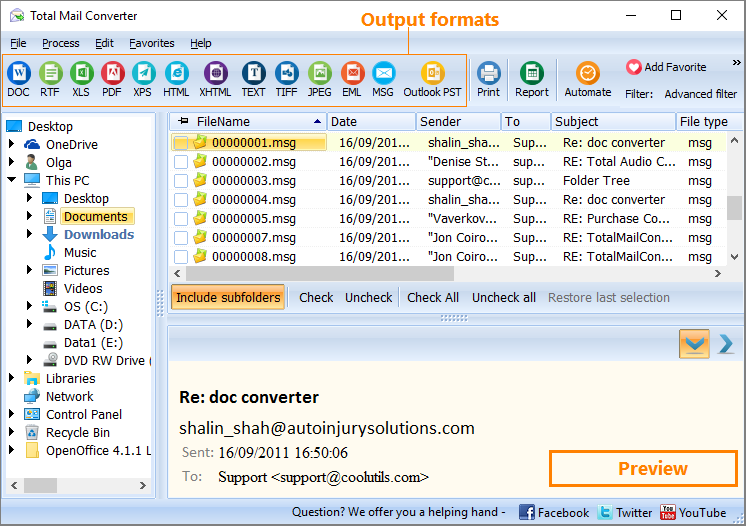 Total Mail Converter supports batch conversion that is much quicker option. This way you group all source emails and convert them together as easily as one single file. Each email file contains information for all fields like From:, To:, Date:, Subject:, Body:. Some of them contain unimportant information and are not required to be exported to ODT. For such cases this email converter allows converting only specific set of fields. 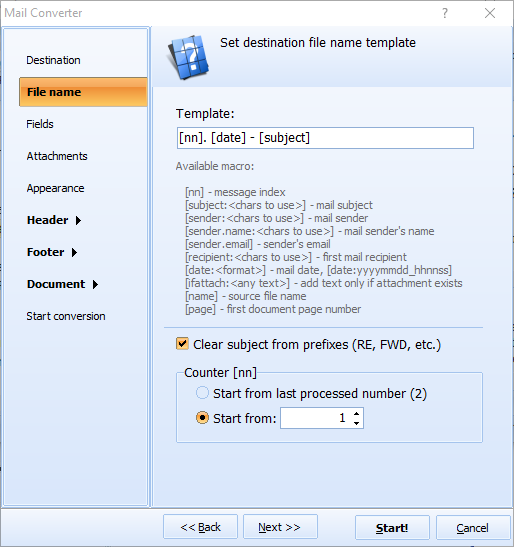 As a result you will get maximally compact ODT copy of information, stored in email files. Total Mail Converter works in a few ways. Handy user interface provides easy access to all conversion features of the program. You can also convert emails using command line. The program is enabled by a text command that contains all conversion parameters. Don't worry, if you are not a professional - all parameters are listed in the 'Help' menu. One more variant is converting email files from the right-click menu of the file. Just click on file icon on the desktop, and use 'convert to' option. You have a chance to test Total Mail Converter before to purchase it. Its trial version is valid for 30 days that will be enough for trying all its features.